Our Portable Wood Stoves are a perfect complement to a cold winter camping trip. Hot Tents have been exploding in popularity over the last several years, and for good reason. Winter trips are beautiful, crisp, and often serene as other campers are deterred by the frosty temperatures. We utilize Grade II Titanium in our stoves because it is lighter weight than stainless, and it has melting temp rouhly 500 degrees higher. Titanium transmits more heat, is lightweight, stronger, and will last longer than a portable wood stove made from other materials. 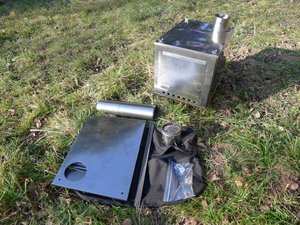 These stoves assemble easily, and dissasemble to nearly flat and the stove pipe rolls up into a cylinder. Due to titaniums heat transfer efficiency, these are capable of heating your tent when it's really cold out and can keep coals for hours. Availability: Stoves are always in production. Sometimes we have some models in stock, sometimes they are being built and can take 2 - 4 weeks. Note: These are approved for winter use on Grand Canyon river trips, however you need to contact them and tell them you plan to use one. In other words they will work great for winter trips where fire pans have traditionally been required. Fire Box Width 6" 8" 8" 10.25" 10.25" 11"
Fire Box Height 6" 8" 8" 8" 10.25" 13"
Fire Box Length 9" 10.25" 14" 14" 14" 16"
Assembled Height 9" 12" 12" 12" 15" 18"